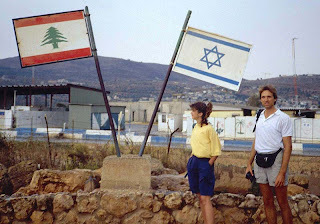 When invoking the name Lebanon these days, it tends to conure up images of crazed Jihadi fanatics and Israel haters but that was not always the case. In fact there was once a strong trend toward pro-Zionism within the Maronite Church of Lebanon (once the largest and most powerful religious community in that country) in the late 19th and early 20th centuries up untill the establishment of the state of Israel. The movement was spearheaded by the Maronite Patriarch Antoine Pierre Arrida and Archbishop Ignace Mubarak of Beirut. If anything, this was a marriage of convenience. After all the Christians of Lebanon and the Jews of (then) Palestine were both minorities (in the case of the Maronites this was slowly but surely coming true) surrounded by a hostile Muslim majority. It was only natural to form a sort of alliance. It began with the church reaching out to the Jewish agency and a pact was formed (it was to remain a secret -lest it further arouse the ire of the Muslims) . The church's stance did not neccesarily reflect a consensus of views among the Christian populace, the secular Phalange party (founded by Pierre Gemayel) did not support the creation of the state of Israel mostly because of economic concerns and other reasons and neither did they support the Church isolationists who wanted to create an independent Christian state in Mount Lebanon and its environs. The first encounter between the Jewish settlers and Lebanese was under unfortunate circumstances. During the Maronite-Druze war of 1860 -when the latter gained the upper hand and were methodically slaughtering the Christians- the Maronites turned in desperation to Europe for help. The first two European personalities to respond were, Sir Moses Montefiore a wealthy Jewish communal leader in London,and Adolph Cremieux a distinguished French Jewish statesman. Montefiore ensured that the plight of the Maronites receive prominent coverage in the London Times and set up a fund to assist the survivors to which he gave generously of his own money. Cremiuex proved instrumental in persuading the French to send troops to Lebanon to save the Christians. French intervention indeed saved the Christians and brought about the creation of the Maronite dominated Mutasarifiya. These philantropic acts were warmly recalled even years later by the Maronite Church and later strongly impacted its attitude toward the Jewish community and the State of Israel. Arrida was also involved in rescue efforts of German Jews after Hitler's rise to power in that country. Arrida and other Lebanese Christian leaders even floated the idea of admitting these Jews to Lebanon. Ten Years later when the demand for a Jewish State was gaining steam, the UN formed a special commission to examine the feasibility of establishing a Jewish state. The following is the very interesting testimony of Maronite Archbishop Mubarak in front of the UNSCOP commission. To Mr. Justice Sandstrom, Chairman, UNSCOP Geneva, Switzerland. I regret that my absence in Europe coincided with the visit of the Special Committee on Palestine to the Lebanon, otherwise I should have had an opportunity to speak and to express my opinion – which is,moreover, that of the majority of the Lebanese people with regard to this question. This is not the first time I have voiced my opinion on this matter. A lot of ink has already been used and after each of my complaints the world press has seized upon my words and made ample comment on everything I said. Here in the Middle East, which is for the most part Moslem, if the present Lebanese Government is recognized as having an official right to speak on behalf of the Lebanese nation, we should feel disposed to answer and prove that the present rulers represent only themselves and that their so-called official statements are dictated only by the needs of the moment and by the imposed solidarity binding this preeminently Christian country to the other Islamic countries which surround it on all sides and enclose it, volens nolens, in their politico-economic orbit. By reason of its geographical position, history, culture and traditions, the nature of its inhabitants and their attachment to their faith and ideals, the Lebanon has always, even under the Ottoman yoke, kept itself out of the clutches of the other nations surrounding it and has succeeded in maintaining its tradition intact. Palestine, on the other hand, the ideological centre of all Old and New Testament,has always been the victim of all the troubles and persecutions. From time immemorial, anything with any historical significance has always been ransacked, plundered and mutilated. Temples and churches have been turned into mosques and the role of that eastern part of the Mediterranean has, not without reason, been reduced to nothing. It is an incontestable historical fact that Palestine was the home of the Jew and of the first Christians. None of them was of Arab origin. By the brutal force of conquest they were forced to become converts to the Moslem religion, That is the origin of the Arabs in that country. Can one deduce from that that Palestine is Arab or that it ever was Arab? Historical vestiges, monuments and sacred mementos of the two religions remain alive there as evidence of the fact that this country was not involved in the internal war between the princes and monarchs of Iraq and Arabia. The Holy Places, the temples, the Wailing Wall, the churches and the tombs of the prophets and saints, in short, all the relics of the two religions, are living symbols, which alone invalidate the statements now made by those who have little interest in making Palestine an Arab country. To include Palestine and the Lebanon within the group of Arab countries is to deny history and to destroy the social balance in the Near East. These two countries, these two homelands[Lebanon and the Jewish National Home as a successor to Mandatory Palestine] have proved up till now that it is both useful and necessary for them to exist as separate and independent entities. The Lebanon, first of all, has always been and will remain a sanctuary for all the persecuted Christians of the Middle East. It was there that the Armenians who escaped extermination in Turkey found refuge. It was there that the Chaldeans of Iraq found a place of safety when driven from their country. It was there that the Poles, in plight from a blazing Europe, took refuge. it was there that the French, forced out of Syria, found protection. It was there that the British families of Palestine, fleeing from terrorism, found refuge and protection. The Lebanon and Palestine must continue to be the permanent home of minorities. What has the role of the Jews been in Palestine? Considered from this angle, the Palestine of 1918 appears to us a barren country, poor, denuded of all resources, the least developed of all the Turkish vilayets. The Moslem-Arab colony there lived an the borderline of poverty. Jewish immigration began, colonies were formed and established, and in less than twenty years the country was transformed: agriculture flourished, large industries were established, wealth came to the country. The presence of such a well-developed and industrious nation, next to the Lebanon could not but contribute to the welfare of all – the Jew is a man of practical executive ability, the Lebanese is highly adaptable and, for that reason, their proximity could only servo to better the living conditions of the inhabitants. From the cultural point of view these two nations may boast that they have as many cultured and intellectual people as all the other countries of the Near East put together. It is not fair that the LAW should be imposed by an ignorant majority desirous of imposing its will. It would not be fair to allow a million advanced and educated human beings to be the plaything of a few interested persons who happen to be at the head of affairs, who lead several million backward and unprogressive people and dictate the LAW as they please. There is an order in the world, an order which establishes the proper balance. if the United Nations are really desirous of maintaining this order, it must do everything possible to consolidate it. That is the opinion of the Lebanese whom I represent; it is the opinion of this people whom your Committee of Enquiry was unable to hear. Behind the closed doors of the Sofar Hotel you were able to listen only to the words dictated to our so-called legal representatives by the lords and masters of the neighboring Arab countries. The real voice of the Lebanese was smothered by the group who falsified the elections of 25 May. THE LEBANON DEMANDS FREEDOM FOR THE JEWS IN PALESTINE AS IT DESIRES ITS OWN FREEDOM AND INDEPENDENCE. "Le voyage de mgr. Arida, patriarche maronite"
For many years there were disagreements among Rabbis and historians alike regarding the origins of the Ethiopian Jews (Falashas). Translation (mine): "They are undoubetedly descended from the tribe of Dan and because there were no competent Torah scholars among them, they only understood Torah in the literal sense, however if they were properly taught they would not deny the teachings of our sages. They should be considered as a 'captive child' who knows no better"
When Operation Moses first airlifted thousands of Ethiopian Jews to Israel in 1984, the questions regarding their status was again posed to the leading Rabbinical authorities of that time. Then Sephardic Rishon LeZion Rabbi Ovadia Yosef ruled that they are Jews and based his ruling on the previous one of the Radvaz. Rabbi Yosef pointedly added "if our Ashkenazy brethren refuse to accept them , we will welcome them". Indeed some in the Ashkenazic Haredi community do not accept them as Jews (Chabad among others). A recent scientific study sheds light on the origins of the Falashas lending credence to those who have long claimed that there is no racial distinction between Ethiopian Jews and non-Jews and in fact all Ethiopians share a common genetic as well as religious heritage. The legend of Solomon and Sheba is just that,a legend ( and it is entirely possible that the Ethiopian royal family is indeed descended from this union-I guess we will have to wait for genetic testing to confirm that- but there is no indication of Israelite origin among the general Ethiopian populace. Gerard Lucotte and Pierre Smets in Human Biology (vol 71, December 1999, pp. 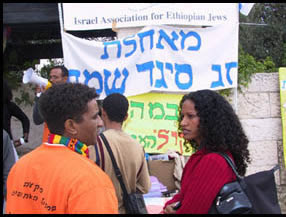 989 – 993) studied the DNA of 38 unrelated Beta Israel males living in Israel and 104 Ethiopians living in regions located north of Addis Ababa and concluded that "the distinctiveness of the Y-chromosome haplotype distribution of Beta Israel Jews from conventional Jewish populations and their relatively greater similarity in haplotype profile to non-Jewish Ethiopians are consistent with the view that the Beta Israel people descended from ancient inhabitants of Ethiopia who converted to Judaism." This study confirms the findings of an earlier study by Avshalom Zoossmann-Disken, A. Ticher, I. Hakim, Z. Goldwitch, A. Rubinstein, and Batsheva Bonné-Tamir titled "Genetic affinities of Ethiopian Jews," published in Israel Journal of Medical Sciences 27:245 (1991). A study of Y-chromosome biallelic haplotypes of Jewish and non-Jewish groups titled Jewish and Middle Eastern non-Jewish populations share a common pool of Y-chromosome biallelic haplotypes and published in Proceedings of the National Academy of Sciences in June, 2000 suggested that "paternal gene pools of Jewish communities from Europe, North Africa, and the Middle East descended from a common Middle Eastern ancestral population," with the exception of the Beta Israel, who were "affiliated more closely with non-Jewish Ethiopians and other North Africans.". These Y-chromosome studies only speak to the paternal lineage (some ethnic groups are a product of one maternal lineage and a different paternal lineage, see Métis people (Canada), but a study of the Mitochondrial DNA (which is passed only along the maternal lineage) shows that the most common mtDNA type found among the Ethiopian Jewish sample was present elsewhere only in Somalia, furthering the view of most that Ethiopian Jews are of local (Ethiopian) origin. However, a study performed by the Department of Biological Sciences at Stanford University did find a possible genetic similarity between 11 Ethiopian Jews and 4 Yemenite Jews who took part in the testing. The differentiation statistic and genetic distances for the 11 Ethiopian Jews and 4 Yemenite Jews tested were quite low, among the smallest of comparisons that involved either of these populations. Ethiopian Jewish Y-Chromosomal haplotype are often present in Yemenite and other Jewish populations, but analysis of Y-Chromosomal haplotype frequencies does not indicate a close relationship between Ethiopian Jewish groups. It is possible that the 4 Yemenite Jews from this study may be descendants of reverse migrants of African origin, who crossed Ethiopia to Yemen. The result from this study suggests that gene flow between Ethiopia and Yemen as a possible explanation. The study also suggests that the gene flow between Ethiopian and Yemenite Jewish populations may not have been direct, but instead could have been between Jewish and non-Jewish populations of both regions.